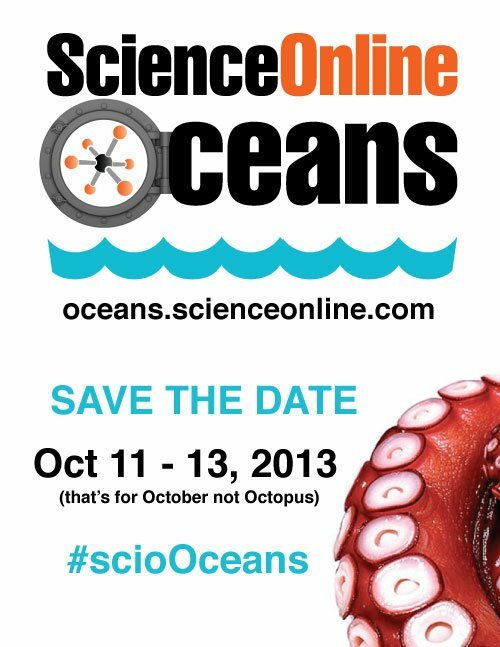 ScienceOnline Oceans starts on October 11th, one month from today! Here’s what you need to know in order to make the most of the meeting. 1) There are still spots available! If you’ve been considering attending (or if you are already planning attending and know others who might be interested), there are still spots available! The conference registration fee remains $150 for students and $200 for others. Register here. 2) Make your hotel reservation this week! If you haven’t yet made your hotel reservation, you need to do it THIS WEEK! We strongly recommend staying at the conference hotel, as bus transportation to conference events and field trips is to and from the hotel. Additionally, the hotel bar is the evening social gathering place for the conference. We consider time at the hotel as part of the conference! You don’t need to pay at the time you make the reservation, you pay when you check out. ScienceOnline is financially responsible for paying for the rooms we contracted for (if we don’t get enough reservations)! 4) Sign up for workshops! All workshops are Friday, October 11th from 1-4 P.M at the Sonesta, and have a fee of $75. There is currently space available in every workshop. Explore available workshops and register for them here. As of today, these workshops are being opened up to people not attending the conference to help fill spots. **Please note that if you are planning on participating in a Friday afternoon workshop, it may be easier to fly in Thursday night, a limited number of hotel rooms are available at the conference rate on Thursday evening**. 5) Sign up for field trips! All workshops are on Sunday, October 13th. They will leave from the Sonesta early in the morning and return late afternoon/early evening (except for the A.M. shark tagging trip, which will return the hotel early afternoon). Each has a fee of $100. As of today, these workshops are being opened up to people not attending the conference to help fill spots. **Please note that if you are planning on participating in a Sunday field trip, it may be easier to fly home Monday morning, and a limited number of hotel rooms are available at the conference rate on Sunday evening**. 6) Sign up for a Saturday night dinner! Dinners on Saturday, October 12th will be at a variety of restaurants within a few blocks of the Sonesta. We’ve chosen restaurants featuring a variety of cuisines and price ranges. Some dinners will have structured discussion expanding on conversations earlier in the day, while others are open. Please explore the dinners and sign up for one here. After dinner, we’ll all meet back up at the Sonesta pool bar. 7) Explore the venues. The panel discussion and opening social will take place on Friday, October 11th at the Miami Science Museum. The main conference will take place at the Whitten Learning Center at the University of Miami. Explore these venues here. 8) Explore the list of attendees and the schedule! Get excited to see old friends and make new ones, explore our “look who’s coming” directory! Additionally, we have 5 timeslots, each with 5 concurrent sessions. Look over the schedule in advance to make sure that you don’t miss anything! 9) Become a sponsor and help us make ScienceOnline Oceans happen! If your university, NGO, company, etc is interested in becoming a sponsor, look over this information and let us know if you have any questions! 10) Start discussions in advance online! The conference hashtag is #ScioOceans , and each session has it’s own hashtag . Use it and the look who’s coming directory to start conversations about topics which will be discussed at the conference. I can’t wait to see everyone in a month!